No state rates have changed since July 2018, when Louisiana’s declined from 5.0 to 4.45 percent. The District of Columbia’s sales tax rate increased to 6 percent from 5.75 percent. In addition to state-level sales taxes, consumers also face local sales taxes in 38 states. These rates can be substantial, so a state with a moderate statewide sales tax rate could actually have a very high combined state and local rate compared to other states. 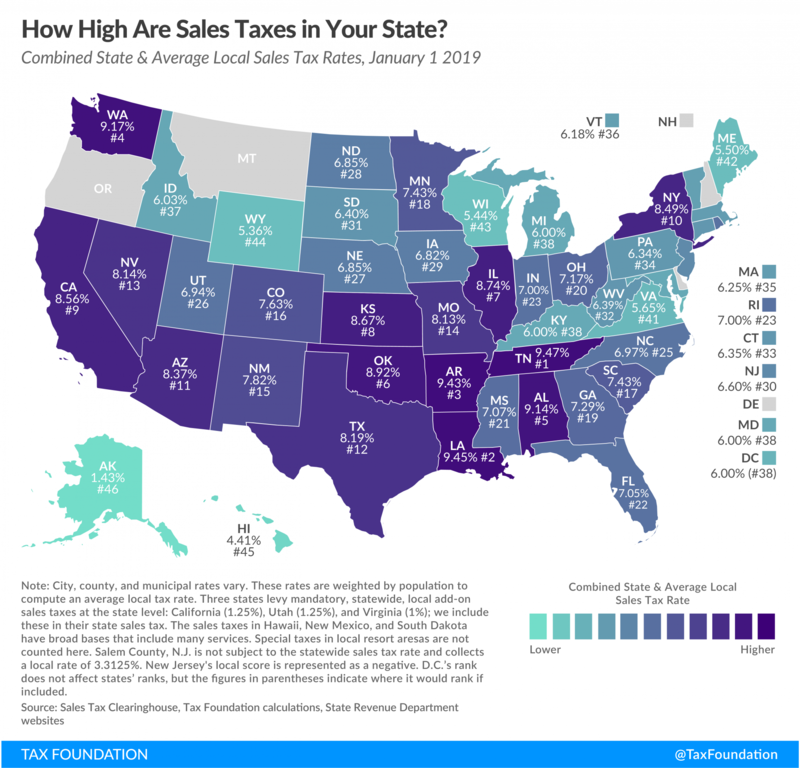 This report provides a population-weighted average of local sales taxes as of January 1, 2019, to give a sense of the average local rate for each state. Table 1 provides a full state-by-state listing of state and local sales tax rates. The five states with the highest average combined state and local sales tax rates are Tennessee (9.47 percent), Louisiana (9.45 percent), Arkansas (9.43 percent), Washington (9.17 percent), and Alabama (9.14 percent). The five states with the lowest average combined rates are Alaska (1.43 percent), Hawaii (4.41 percent), Wyoming (5.36 percent), Wisconsin (5.44 percent), and Maine (5.50 percent). No states have changed their statewide sales tax rates since July 2018, although the District of Columbia raised its sales taxes from 5.75 percent to 6 percent in October. The five states with the highest average local sales tax rates are Alabama (5.14 percent), Louisiana (5.00 percent), Colorado (4.73 percent), New York (4.49 percent), and Oklahoma (4.42 percent). Average local rates rose the most in Florida, jumping the state from the 28th highest combined rate to the 22nd highest. The change was largely due to a 1 percent sales tax in Broward County and a 1.5 percentage-point local increase in Hillsborough County. Colorado maintained its ranking, but saw 39 counties raise their sales taxes, including Central City’s increase from 4 percent to 6 percent at the start of 2019. Utah’s rank rose three spots, to 26th. This is largely due to Salt Lake County and Salt Lake City increasing their local sales taxes by and 0.25 and 0.5 percent, respectively. Nebraska saw the largest decrease in sales taxes this year, improving its combined state and local sales tax ranking by two spots. Lincoln drove this change by decreasing its sales tax from 1.5 percent to 1.0 percent, offsetting increases in a few smaller Nebraska municipalities. While Wyoming’s ranking did not change, the state saw the year’s second-largest combined sales tax decrease when Carbon County’s 1 percent special purpose tax expired. (b) Three states levy mandatory, statewide, local add-on sales taxes at the state level: California (1%), Utah (1.25%), and Virginia (1%). We include these in their state sales tax. (c) The sales taxes in Hawaii, New Mexico, and South Dakota have broad bases that include many business-to-business services. (e) Salem County, N.J. is not subject to statewide sales tax rates and collects a local rate of 3.3125%. New Jersey’s local score is represented as a negative. Source: Sales Tax Clearinghouse; Tax Foundation calculations. Avoidance of sales tax is most likely to occur in areas where there is a significant difference between two jurisdictions’ rates. Research indicates that consumers can and do leave high-tax areas to make major purchases in low-tax areas, such as from cities to suburbs. For example, evidence suggests that Chicago-area consumers make major purchases in surrounding suburbs or online to avoid Chicago’s 10.25 percent sales tax rate. Sales Tax Clearinghouse publishes quarterly sales tax data at the state, county, and city levels by ZIP code. We weight these numbers according to Census 2010 population figures to give a sense of the prevalence of sales tax rates in a particular state. “District of Columbia Tax Rates Changes Take Effect Monday, October 1,” DC.gov, Sept. 5, 2018, https://otr.cfo.dc.gov/release/district-columbia-tax-rates-changes-take-effect-monday-october-1. “Florida (FL) Sales Tax Rate Changes,” Sale-tax.com, Jan. 1, 2019, http://www.sale-tax.com/Florida-rate-changes. “Colorado (CO) Sales Tax Rate Changes,” Sale-tax.com, Jan. 1, 2019, http://www.sale-tax.com/Colorado-rate-changes. “Utah Sales and Use Tax Rates,” Tax.utah.gov, Jan. 1, 2019, https://tax.utah.gov/sales/rates. “Changes in Local Sales and Use Tax Rates – Effective October 1, 2018,” Revenue.nebraska.gov, Oct. 1, 2018, http://www.revenue.nebraska.gov/news_rel/aug_18/Changes_in_Local_Sales_and_Use_Tax_Rates_10-1-2018.html. “Wyoming sales tax rate changes, October 2018,” Avalara.com, Sept. 14, 2018, https://www.avalara.com/taxrates/en/blog/2018/09/wyoming-sales-tax-rate-changes-october-2018.html. Mehmet Serkan Tosun and Mark Skidmore, “Cross-Border Shopping and the Sales Tax: A Reexamination of Food Purchases in West Virginia,” Research Paper 2005-7, Regional Research Institute, West Virginia University, September 2005, http://rri.wvu.edu/wp-content/uploads/2012/11/Tosunwp2005-7.pdf. See also T. Randolph Beard, Paula A. Gant, and Richard P. Saba, “Border-Crossing Sales, Tax Avoidance, and State Tax Policies: An Application to Alcohol,” Southern Economic Journal 64, no. 1 (July 1997): 293-306. For a list, see Jared Walczak, Scott Drenkard, and Joseph Bishop-Henchman, 2019 State Business Tax Climate Index, Tax Foundation, Sept. 26, 2018, https://taxfoundation.org/publications/state-business-tax-climate-index/. For a representative list, see Jared Walczak, Scott Drenkard, and Joseph Henchman, 2019 State Business Tax Climate Index.